I first shared this recipe on Centsless Meals where I am a Contributor. 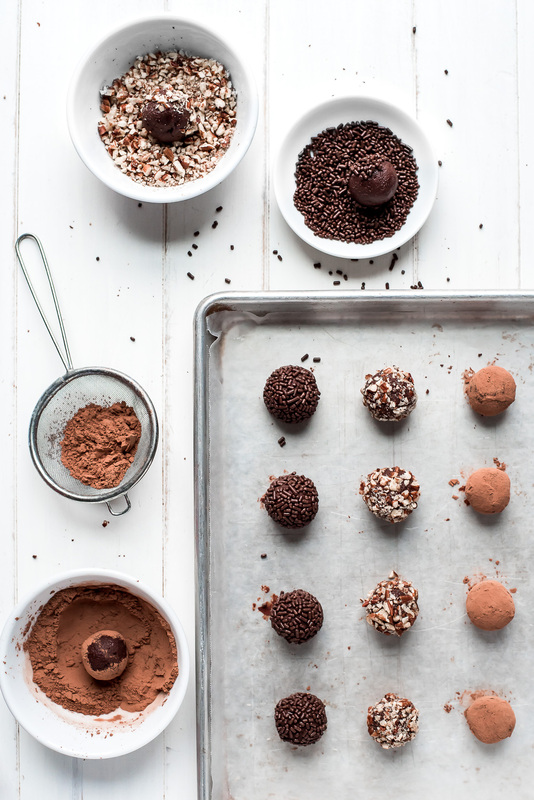 4-Ingredient Chocolate Truffles are the perfect way to satisfy your chocolate craving. Roll them in a variety of toppings and make your own box of chocolates! 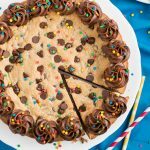 PIN TO YOUR CANDY RECIPES BOARD TO SAVE IT! I eat chocolate everyday. I can’t go a day without it. Does that make me an addict? 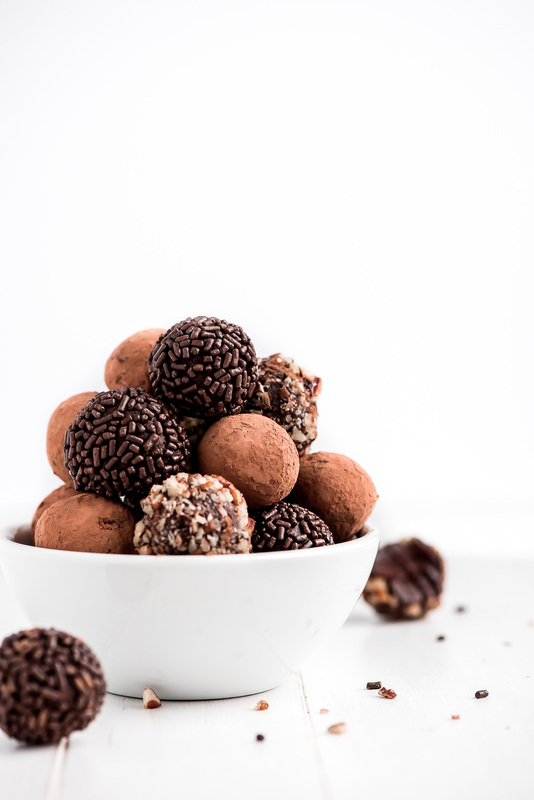 I really just see it as a main food group and these 4-Ingredient Chocolate Truffles are just one way of getting my chocolate in for the day. These chocolates are divine! As soon as they touch your lips they begin to melt away and you become lost in that rich deep chocolate coma. If you’re trying to find a way to someone’s heart this Valentine’s Day (or really any time of the year), it’s through these Chocolate Truffles. Truffles are actually a type of fungi (mushroom). They are actually a delicacy despite looking like a large animal dropping. Chocolate Truffles somewhat resemble the fungi truffle so that is how they got their name “truffle”. 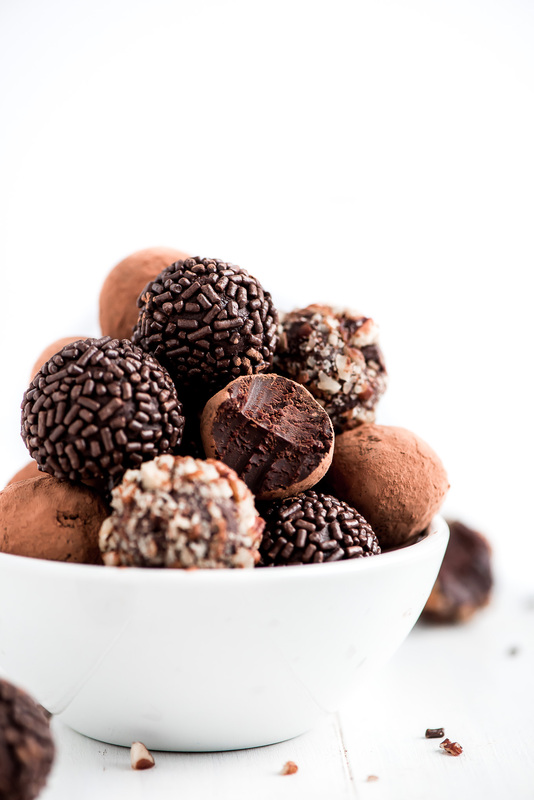 Chocolate Truffles are a type of chocolate with a ganache interior and either a hard chocolate, cocoa, or nut exterior. Truffles are among the higher priced chocolates but they’re actually quite easy to make yourself. It only takes 4 simple ingredients. The first step in making chocolate truffles is to make the ganache. I LOVE ganache! 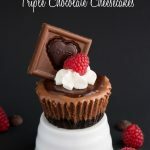 Typically I make it for adding to the top of cakes and cupcakes like in my Raspberry Chocolate Swiss Roll and Chocolate Dipped Strawberry Cupcakes. To make ganache, all you need is some good quality chocolate and heavy whipping cream. Heat up the cream and then pour it over the chocolate and allow it to melt for 2-3 minutes and then whisk them together until smooth. It will be the consistency of hot fudge. In this state, it’s perfect for adding to cakes but for making truffles you have to let it cool and firm up so you can form it into balls. You’ll place your ganache in the fridge for about an hour until it’s cool and firmed up. Next, you’ll need to portion out the chocolate. I find the easiest way is to use a small trigger scoop. 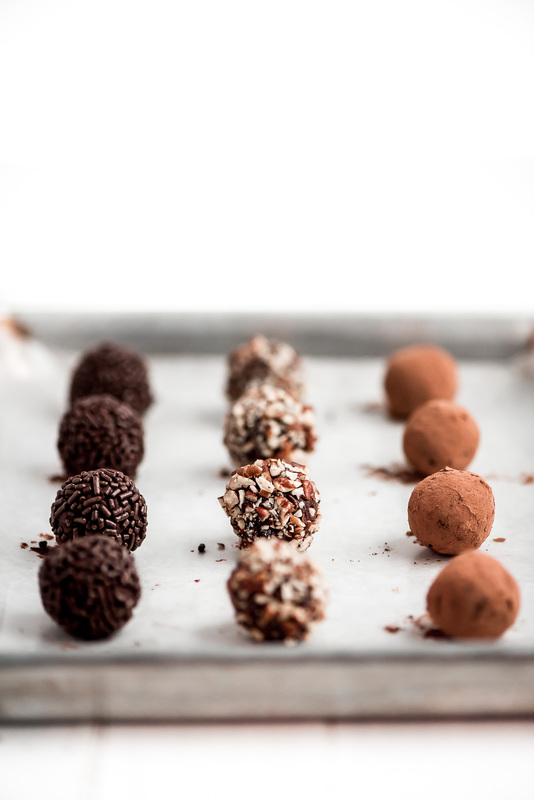 A #60 is the perfect size for making truffles, holding just 2 teaspoons. After portioning the chocolate you’ll then quickly roll it into a ball. You need to work fast because the chocolate starts to get soft and melt in your warm hands. 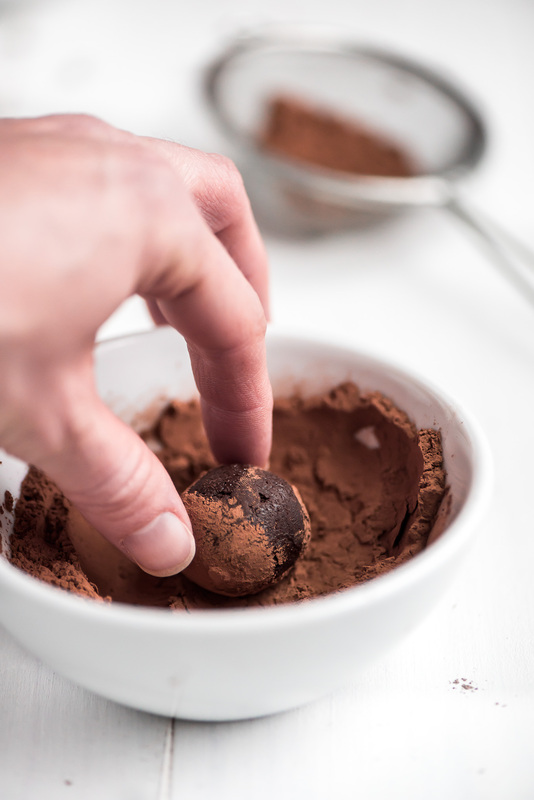 Since the outside of the truffle is slightly melted from your hands, the coating can easily adhere. After rolling, quickly roll in your outer coating of choice. Set on a wax or parchment paper and repeat with the rest of the firm ganache. What can I coat my Truffles in? Here I took the easy route and coated the ganache in cocoa power, chopped roasted pecans, or chocolate sprinkle. You can very well dip them in chocolate too, roll them in fun colored sprinkles, or other various nuts. The better the chocolate, the better the truffle! Quality chocolate is a must. You can get chocolate bars like Lindt or Ghirardeli, it just needs to be at least 60% cocoa. For these truffles I actually used Ghirardelli’s 60% dark chocolate chocolate chips. Small Trigger Scoop – This small trigger scoop portions out 2 teaspoons of the ganache. It makes the perfect size truffles. Liquid Measuring Cup – I have had this measuring cup for almost 10 years! You need a glass measuring cup in your kitchen. It’s heat safe so measure and heat right in the same container. 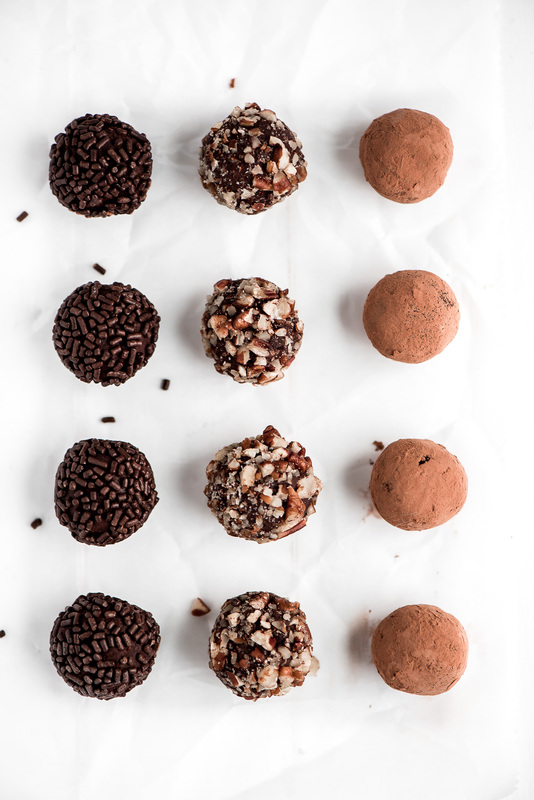 4-Ingredient Chocolate Truffles are the perfect way to satisfy your chocolate craving. 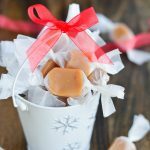 Roll them in a variety of toppings and make your own box of chocolates! Heat cream in the microwave or pot until it starts to steam. Place chocolate in a heat proof bowl and pour the cream over the top. Cover and let sit for 3 minutes. Whisk until smooth. Stir in the vanilla and let cool at room temperature for about 15 minutes and then place in fridge for about an hour until it's cool and has firmed up. Place cocoa powder, chocolate sprinkles, and toasted pecans each in separate bowls and set aside. Using a trigger scoop or a spoon, scoop into 2 teaspoons portions of chocolate and place on wax paper or parchment. 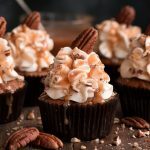 Roll the chocolate in your hands to create a ball and then roll in either cocoa powder, chocolate sprinkles, or toasted pecans. Set back on the paper. Store for up to 2 weeks in the fridge. Serve at room temperature.